HP is having difficulty fulfilling orders for its latest and greatest Ultrabook, the Envy Spectre XT. The HP Envy Spectre XT was announced back in May, with an expected launch date of June 8. However, now at the end of July, orders are still backed up. "HP Envy SpectreXT orders are taking longer to fulfill than HP expected," an HP spokesperson said. "We are contacting all customers who have placed orders to provide updated expected delivery dates." 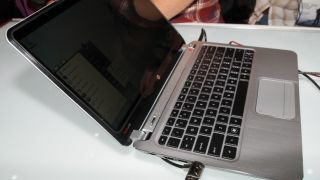 The Envy Spectre XT was set to be HP's new top-end Ultrabook, billed as the firm's thinnest and lightest to date, weighing 3.07 lbs and measuring 14.5mm thick. It features a 13.3-inch display with 1366 x 768 resolution, Intel's Ivy Bridge, 4GB of RAM, a 128GB solid state drive, and boasts 8 hours of battery life. Attempting to place an order now for the Ultrabook shows a new expected shipping date of August 28. Other HP laptops, on the other hand, show a shipping date of August 14. HP has not provided an explanation for the delay.